"In 1916, 1,200 Wakefield residents contributed a total of $12,000 to buy the land to build a new public library. Soon after, Junius Beebe donated an additional $60,000 to build the library in memory of his father, Lucius Beebe. According to the 1917 Town Report, the Library Building Committee and Mr. Beebe decided to postpone the project due to the unsettled conditions in the business world and the high cost of building materials. The money was put into the Wakefield Trust Company. Other members of the Beebe family made generous donations to the fund by the time the building was erected, it was said that the fund had risen to more than $200,000. Progress was made in 1919 when Town Meeting voted to accept the deeds of Edward Mansfield and the Cushing family, both of which were already in the name of building committee treasurer Arthur Evans, and Mrs. Hickok. 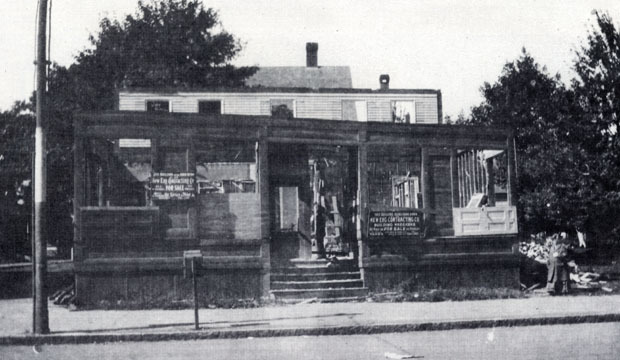 John White deeded an additional tract of land at 361 Main Street, at the north of the lot, to the Town in 1921. His lot was later used for the Post Office. The project was delayed again, until 1921 when the building committee selected its architects, Cram & Ferguson, and work began. It appears that the committee wanted to save on demolition costs the sign on the building read: 'This building is being torn down by New Eng. Contracting Company, building wreckers. All materials offered for sale on the premises.' The cornerstone for the new building was laid on March 17, 1922. The new library was dedicated on April 15, 1923." - Text from calendar by Jayne M. D'Donofrio. “Main and Avon Streets, circa 1921,” NOBLE Digital Heritage, accessed April 20, 2019, https://digitalheritage.noblenet.org/noble/items/show/7014.